That audience of 16 million is better than March Madness, the NBA Finals or the World Series averaged within the last year. It also has lots of room to grow as soccer's reach expands. PORTLAND, Ore. (TheStreet) -- The U.S. soccer audience was already growing by the time the national team took the pitch against Ghana. Having the home play its first match certainly didn't hurt. The prospects for a growing domestic audience are bolstering the fortunes of a handful of leading media companies that have recently gotten into the game. Those include ESPN (owned by a joint venture between Disney (DIS - Get Report) and Hearst) Fox (FOXA and Telemundo (owned by Comcast (CMCSA - Get Report)). According to Nielsen, roughly 15.9 million people tuned in to watch goals from Clint Dempsey and John Brooks give the U.S. the edge it needed in a tough 2-1 win against Ghana. It was the first win against the Black Stars by the U.S. side since being eliminated by Ghana in the second round in 2010, which followed a first-round loss to the same squad in 2006 to boot the U.S. out of that year's tournament. It's also a huge leap forward for U.S. soccer viewership. The most-watched first-round matchup in U.S. history is still its 1-1 draw with England to open the 2010 World Cup. However, that aired on network television on ABC to a far broader audience. To put this year's U.S. win in perspective, the 11.1 million who watched on ESPN alone easily trumps the 6.6 million viewers who watched the loss to Ghana in 2006 on ESPN and Univision combined. It also far exceeds the 6.16 million ESPN drew for an opening round match between the U.S. and Algeria in 2010 -- which was its previous record for a U.S. national team broadcast. The 16 million U.S. viewers who watched in total aren't too far removed from the 19.4 million who saw the U.S. lose to Ghana in the second round back in 2010, either. U.S. soccer has reached the point where its first-round matches are as worthy of home viewers' time as the matches they play after they've advanced. Considering that audience in 2010 was larger than the average drawn by the NBA Finals that year and the audience of 18.3 million who watched the gold-medal men's ice hockey game between the U.S. and Canada in Vancouver, that's no small feat. Already, that 15.9 million beats the 6 million NBC drew for the deciding Game 5 of the National Hockey League's Stanley Cup Final, the 15.5 million viewers ABC averaged for this year's NBA Finals, the 14.9 million Fox averaged for the 2013 World Series and the 10.2 million that CBS, TBS, TNT and TruTV averaged for this year's NCAA college basketball March Madness broadcasts. Granted, it's still well below the peak viewership of any of those last three events, but there's still a lot of World Cup to be played. ESPN, ESPN2 and ABC already see it as a win. They've combined to average 4.112 million viewers through the first 14 matches of the World Cup. That's an increase of 23% over the 3,346,000 through the same stretch of the 2010 World Cup. Univision also couldn't be happier, with ratings through its first 17 broadcasts up 54% from 2010 and its average audience sitting at close to 7 million. That's not counting streaming viewership either. 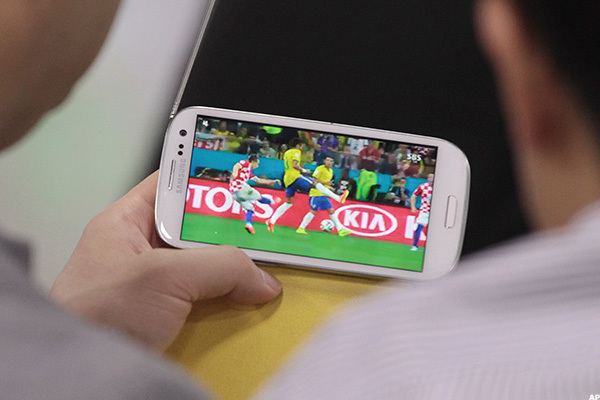 Those with access to the WatchESPN app accounted for 1.4 million viewers of the U.S.-Ghana match. Univision Digital users contributed another 1.7 million streams to the cause. Altogether, that's 19 million viewers who caught the U.S. men's national team's first match of the first round. ESPN is in the last World Cup of its $100 million broadcast deal for the 2010 and 2012 events, while Univision is finishing out a $325 million Spanish-language deal for the same two events. The broadcasters that are taking over in 2018 and 2022 -- Fox and Telemundo -- are going to be paying a lot more for that growing U.S. audience. Fox is putting out $425 million for the English-language rights, while Telemundo had to pay $600 million for the Spanish-language rights that, once again, place famed Argentinian announcer Andres Cantor and his "Goooal!" call at the center of World Cup broadcasts. None of that would work if U.S. audiences were only tuning in for the home team. Last week, ESPN managed pulled in 4.04 million viewers for host nation Brazil's opening match against Croatia. That's 49% greater than its audience for the 2010 World Cup and a bigger U.S. crowd than any World Cup opener in the last 20 years. Univision drew 5.1 million for the same match and the combined broadcast completely overshadowed the 1.87 million who watched golf's U.S. Open. Even Nielsen knows how bright soccer's future in U.S. homes looks. According to its numbers, 73% of soccer's U.S. television audience is 55 or younger. Both Univision and ESPN report that more than half of their World Cup viewership is between ages 18 and 49. Only the NBA can claim a younger audience, while both Major League Baseball and NASCAR deal with the fact that half of their viewership is 55 or older. In golf's case, that's more than 63% of all viewers qualifying for AARP. The National Football league still holds a huge edge, with its regular-season games consistently outdrawing World Cup matches and its Super Bowl viewership topping 110 million. However, with only 29% percent of fans below age 34 -- compared to 40% of soccer's -- and only 8% of its fan base belonging to a growing Hispanic population that already makes up 34% of soccer's viewership, even its ceiling looks a bit lower than soccer's. The U.S. team just showed the nation that it can not only draw viewers, but it can do so at 6 p.m. on a Monday -- and in increasing numbers. With ESPN and Fox just purchasing the rights to U.S. national team and MLS games for $600 million, the U.S. win against Ghana just proved U.S. soccer is a growth industry: Buy in now, or pay dearly later.